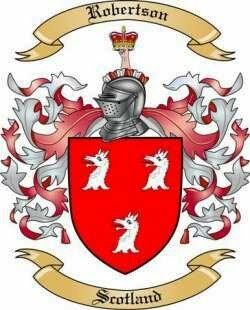 Robertson Coat of Arms: Three silver wolves heads on a red shield. Robertson Crest: A hand holding the crown of Scotland. Robertson, MacConachie, MacConaghy, MacConchie, MacConckey and many more. First found in in Perthshire where they were seated from early times and their first records appeared on the early census rolls taken by the early Kings of Scotland to determine the rate of taxation of their subjects.